This lovely hidden gem of a property sits tucked away in a peaceful, country location. The property has lots of quirky features including beautiful stained glass windows, a spiral staircase and a wonderful pillar brought all the way from India. When entering the property via the front, double doors we are greeted straight away with a warm and welcoming sensation given by the stone walls and exposed wooden beams. To the left we have the lounge area with the spiral staircase in the corner leading up to the mezzanine. To the right we have the kitchen diner. Here there is a change in the wooden floor that goes from a darker brown to a light grey colour, making it easier to distinguish the two areas. The kitchen has plenty of worktop space as well as cupboard space. The current owners had the excellent idea of converting the original fireplace into a pantry, thus creating even more storage. The worktops are all nice and light colours which balance perfectly with the wooden cupboards. Off of the kitchen there is a door leading to a spacious hallway with the laundry room, family bathroom coming off of the right hand side. The family bathroom has a very good sized shower cabinet. Further along there are patio doors leading out onto a covered patio space. Here there is a summer kitchen, perfect for hosting parties on those warm summer nights. Further along the hallway that was just mentioned, we have a second lounge/office area. Here there are patio doors leading outside which also provide excellent views out over the countryside. If need be, this room could always be converted into a second bedroom. Off of this room there is the master room. This room is a good size and has two Velux windows, drowning the room in natural light. The property comes with 1450 metres of land. The plot is pretty flat and has a good variety of fruit trees and is quite private. At the night when sitting on the patio area, there are great views just as the sun starts to fall behind the hills, filling the sky with a lovely red blanket. The property is situated in the village of Chãos. Chaos has a café, mini market a doctor, post office, pharmacy and a weekly fresh and local produce market. Only a short 2 minute drive away we also have the village of Vales. Here there is a hardware shop, petrol station, supermarket, cash machine and café. The town of Ferreira do Zêzere, which is the district capital, is around 17 kilometres from the property. Ferreira do Zêzere has several supermarkets, banks, schools, bus station, shops, builders’ merchants, restaurants and bars. The larger, historic town of Tomar, which is home to the UNESCO world heritage listed Convento do Cristo, is approximately 15-20 minutes’ drive from Chãos. Tomar is a popular town and has all modern day amenities including supermarkets, shops, cafes, restaurants, library, schools, university, cinema, weekly market and a hospital. 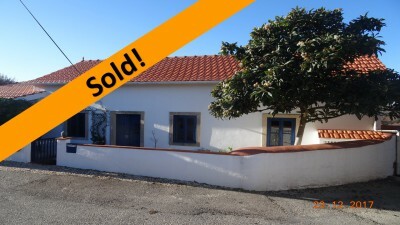 The property is easy to locate and has good access links to the IC3 Tomar to Coimbra road. The closest airport to the property is located at Lisbon, which is approximately one and a half hours’ by car.